Explore the exquisite collection of dazzling diamond stud earrings. Commission your perfect pair of earrings, with a choice of precious metals, and diamond qualities ranging from simple studs to contemporary classics. Our simple and easy-to-use website builder lets you to choose your metal and diamond quality. We hand match each pair of diamonds to create the perfect pair of earrings—whether you are purchasing studs for daily wear or for a loved one ahead of a meaningful occasion or celebration. The humble diamond stud earring can be boosted considerably in size from purchasing with Serendipity Diamonds. Each stud earring style offers outstanding value for money without any compromise on quality. Constructed from high grade precious metal alloys, clients can choose between 950 Platinum, 18ct White Gold, 18ct Yellow Gold, 18ct Rose Gold and 950 Palladium. 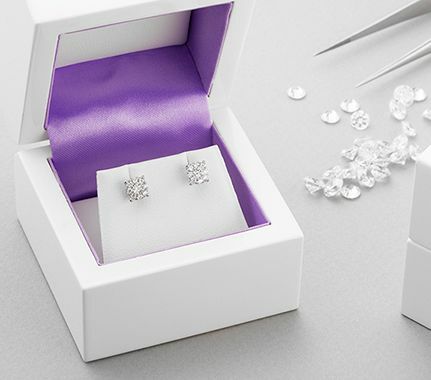 We craft all diamond earrings in-house utilising the work of highly skilled jewellery artisan craftsmen, mounting, setting and hand finishing each piece with incredible attention to detail. Most of our earring designs can be built online, selecting your overall total diamond carat weight, diamond whiteness (colour) and clarity. Typically crafted over 3-4 weeks, your finished commission will be elegantly boxed in our luxury packaging, arriving by signed-for delivery via FEDEX with all duty and tax included before purchase online. We deliver across the UK, Ireland, USA, Canada, Australia and Europe with purchase available in your local currency. All orders are backed by our lifetime warranty for 100% reassurance.